The Stevensville United Methodist Knitting Circle and meets in the Lounge every Thursday afternoon at 2:00 pm except July and August. 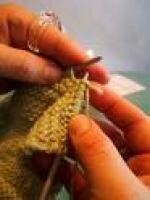 Just bring your own project (knit, crochet, or other type of hand work) and join in the conversation. If you don't have a project of your own to work on, or want to help with our current projects, we have patterns and yarn for you. Just come, join in and have a good time. If you have any questions, just call Virginia Bedunah at 269-429-5571. This past year we were able to give 15 Christmas Stockings along with 20 hats & mittens to the Christmas families, 2 baby blankets, 8 prayer shawls, and 10 sets of hats and mittens to the SUMC Children's Center. We are also sending baby sweaters, blankets, receiving blankets with other baby supplies to the church in Nome, Alaska.